In a far corner of my garden, tucked behind a spruce tree, an old pink rose grows rampantly. I give it little attention and mostly forget about it until I see it blooming with abandon in early summer. I got the rose from my aunt, not once, but twice. The first time she gave me a start of the rose, she said it was from my great-grandmother's garden. I planted it in my first garden, happy to have a link to the past growing near my back door. When I moved, I left the rose behind. Two gardens later, I went back to my aunt and asked for another start of the rose. When I mentioned its origin in my great-grandmother's garden, my aunt looked puzzled. She had no such rose growing in her garden. She explained that this rose was one growing on the property when she and my uncle moved into their house in the mid 1950's. She said their city lot had once been part of a farm, and she just assumed the rose was one planted by the farmer's wife. 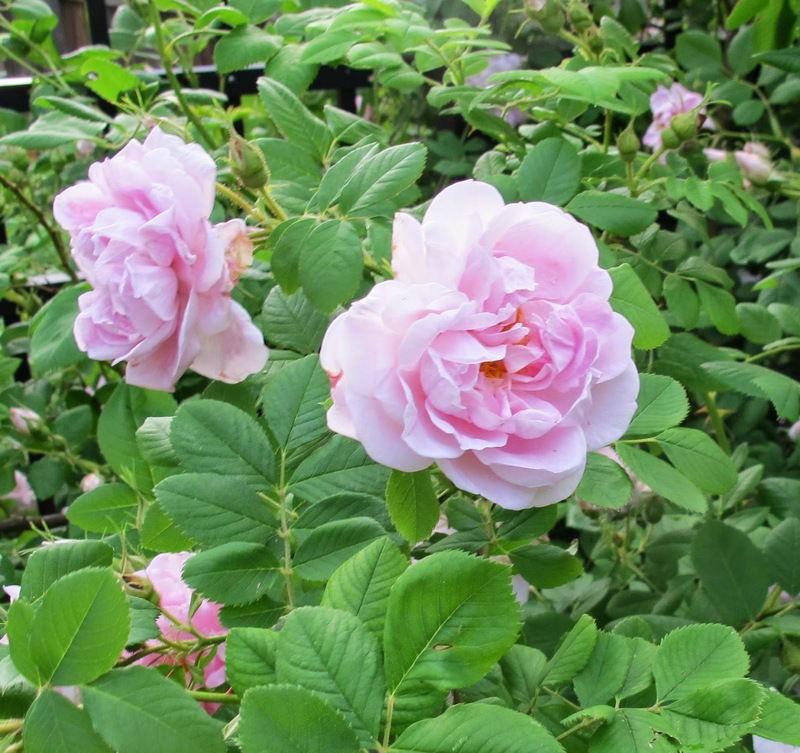 Whatever its origin, the pink rose grows without much fuss or bother on my part. Even after this past winter, one of the coldest winters on record, this rose had very little die back compared to the other roses in the garden. And at the end of the season, its leaves are always still green, with no trace of black spot or other rose diseases. 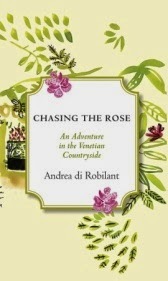 I was reminded of my mysterious rose, which perhaps was once prized by a farmer's wife or my great-grandmother, when I read a review copy of Chasing the Rose: An Adventure in the Venetian Countryside by Andrea di Robilant (Alfred A. Knopf, New York, 2014). di Robilant comes across a rose growing on his ancestral home in Italy and proceeds to try to find out its origin. He takes us on a journey through history going back to Napolean and through modern times with visits to several gardens. Along the way, we learn some history of roses and meet several rosarians. From the beginning, I'm pulled into this world of roses and the author's mystery. It's a mystery I want to see him solve, and so I stayed with the book through the course of one afternoon and evening. Several days later, I'm still thinking about old roses, my rose and the question of what becomes of a garden when the gardener moves on or passes away. What plants do I have growing in my garden that one day become another gardener's mystery? I'm also thinking about di Robilant's book and how a story well-told leaves you with something to hold on to, even after you've finished reading it. You don't have to be obsessed with roses to enjoy this book. It has a universal appeal for anyone who values the past and enjoys the hunt for clues to solve a mystery. I was happy to receive this review copy of Chasing the Rose and plan to pass it along to my good friend Dee, who grows many roses in her garden. I know she will enjoy this story. Thank you for a very interesting blog post. I rarely have time to read novels these days - though I'm determined that will change and am half way through 'The Language of Flowers'. But I'll add this one to my Christmas list. :) In answer to your question about what happens to gardens when the owner leaves, I tend to take a lot with me, to the annoyance of removal firms! I do make sure not to denude the garden I'm leaving though. I think I have that same rose. I got a start from my former neighbor down the street, who had a 19th century farmhouse. Someone told me it was a rootstock from a grafted rose, but I don't care. It's pretty and it's hardy, as you say. It would be fun to find the origin of your rose. You can try the American Rose society or if you have Rose Ramblers in your area they might know more about it. I collect old roses and they are the best in our hot humid summers. The books sound like fun...i love a good mystery. Happy Gardening! Your rose looks like one that belonged to my Aunt, who would be in her mid-ninties now. She said she got it from her mother's garden and it has a wonderful scent and is very hardy. Tried to order it, since it sounds a lot like one of my favorites (Tom Christopher's "In Search of Old Roses), but found out you must have an advance copy; it's due out May 6th. But thanks for alerting me! OH thank you for posting! I've added it to my book request list at the library. It sounds like a good story. That sounds like an interesting read. I love the history of plants and especially the history and romance of the rose. When I grow the Old roses I feel I am reaching back through the centuries.